The first in our flock, the lovely Lula joined us at Thanksgiving 2017. She fast became a fixture on the grounds, known for her ability to recognize cars and her welcoming nature. Lula rules the roost at St. Andrew’s and is a true mother hen to all the other babies – human and chicken alike. Keep an eye out for her copper and red head as she sassily struts around the campus. One of the second generation, Slippers is a Brahma chicken, distinguished by the beautiful feathers on her feet that give her her name. Along with Einstein and Gurgi she joined the St. Andrew’s family at Easter 2018. She is shier than her big sister Lula, but can sometimes be seen making the rounds. These Polish Top Hat sisters are hard to tell apart, but not hard to see in a crowd. Einstein is the lighter of the two and it’s easy to see how her “hair” inspired her name. Gurgi took her name from a similarly styled fantasy character. While their heads may be up in the clouds, their feet stay firmly on the ground. Rarely seen outside of the coop, make sure to peak in to get a glimpse at these majestic mavens. Tanesha is the newest addition to the family and she joined us recently from one of our parishioners’ homes - where she was named after a beloved Pre-K teacher. 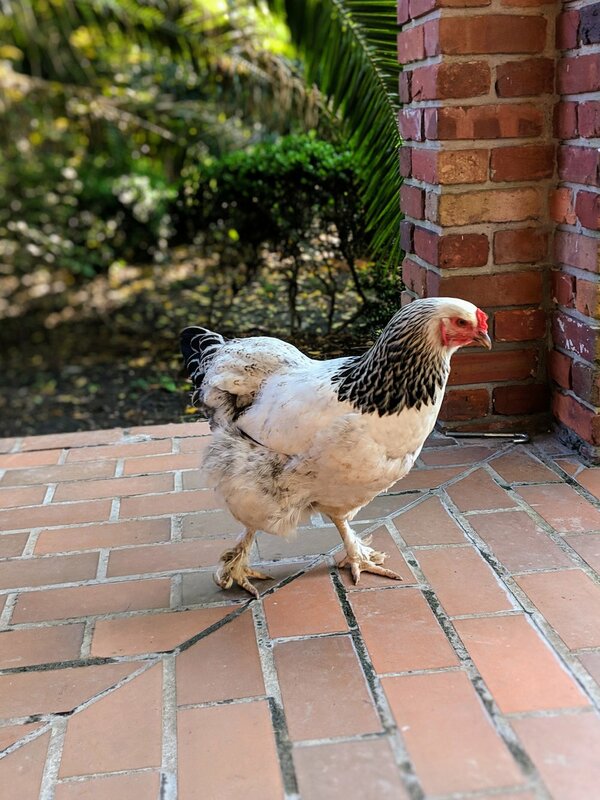 While she was a homebody at first, this lovely golden hen is stretching her wings and stepping out more regularly, usually tagging along behind Lula. While she joins in the second line, she definitely marches to the beat of her own drum.